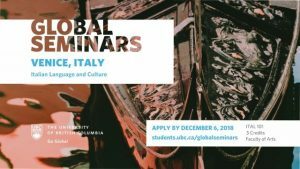 Interested in adding an unforgettable learning experience in Italy to your degree? Here are resources on- and off-campus to help you find and finance your Italian study abroad program. Description: The course is more intense than a standard Italian 101 course, with longer class periods and a number of visits around and outside Venice. The intensity of our Italian 101 course is meant to help you familiarize with the language and the city in a relatively short amount of time, and to provide you with the advantages of the ‘immersion’ experience while in Italy. Every year the Ministry announces an International competion by which a certain number of scholarships are offered to students intending to go to Italy for research reasons (the primary goal) or to study Italian (for two or three months in the summer in Universities like Siena or Perugia). Candidates apply with their home country’s Italian Embassy (usually in April), and the Embassy determines the length of subsidized stay in Italy for each student. Airfare to Italy is not covered.